This is Simone Anderson of New Zealand. Over the last year, she has been chronicling her weight loss on her Facebook page, Simone’s Journey to Health, and on Instagram. Through a combination of exercise, diet, and weight-loss surgery, Anderson has lost nearly 189 pounds. While most of her followers responded positively, others reportedly claimed Anderson was faking, pointing out that her phone was in front of her face in the second photo and that there’s an ostensible lack of excess skin and stretch marks. At first, Simone didn’t respond to her haters. But a few days later, she posted a photo with her pants folded down. Simone is now raising money on Givealittle for surgery to have her excess skin removed. So far, she has raised a little over $4,000. 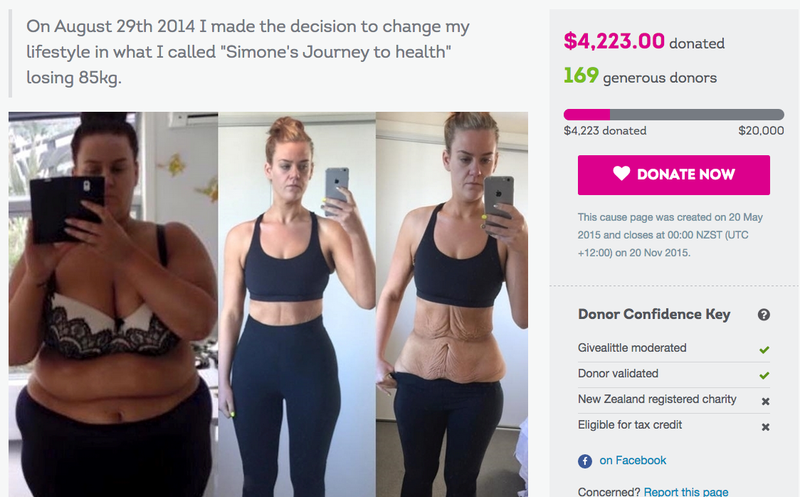 Simone told Buzzfeed that she hopes chronicling her weight loss — stretch marks and all — inspires others. “We would be a much better world if we all started to truly love ourselves from the inside out,” she said.